Windows Media Player is the inbuilt media player for Windows which allows users to play media files. While I wouldn’t call most of Windows applications “best in class,” Windows Media Players remains an exception. It is one of the cleanest and obviously safest media tool. This error could be file specific or with the system. We will troubleshoot it step by step to isolate all possibilities. Windows Media Player is designed to play all legit files. Eg. .mp4 and .wmv files work well with Windows Media Player. However, a few extensions (eg. FLV) and codecs are not supported by WMP. One reason these files are not supported by Windows own inbuilt media player is that they are usually downloaded from websites like Youtube using third-party tools. These files could be played using third-party media players like VLC, however, we strongly recommend not to use the same since they harm the speakers. Furthermore, installing VLC voids the warranty of many laptop brands. If the file extension is supported by Windows Media Player and all files of that extension are not working, then we could assume that there might be a conflict in the system. We could update Windows to troubleshoot the same. 1] Click on the Start button and then on the gear-like symbol to open the Settings page. 2] Go to Updates and Security and then click on Update now. 3] Once the update is done, restart the system. Check if it helps with the issue. Now that we have isolated the issue with the system in the previous solution, we could try reinstalling the Windows Media Player application. 2] Go to Programs and Features and then click on Turn Windows features ON or OFF on the list on the left-hand side. 3] Expand the Media features program and you would find the Windows Media player. 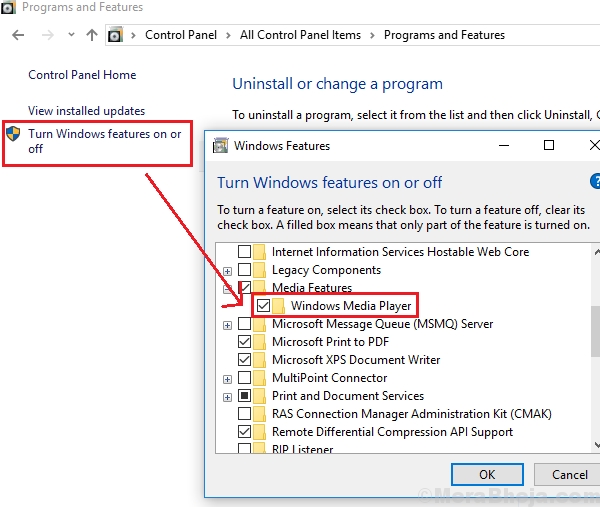 Uncheck Windows Media Player and click on OK.
4] Restart the system and Windows Media Player would get reinstalled by itself, provided the system is connected to the internet. Antivirus software might prevent a file from opening with Windows Media player is they suspect it could be malware. To isolate this possibility, open the antivirus program and disable it. Restart the system. It could be enabled again later. Third-party programs could cause problems while trying to launch media files if they interfere with codecs. This is especially true if free third-party media players have been installed on the system. 1] Press Win + R to open the Run window and type the command control panel. Hit Enter to open the Control Panel. 2] Go to Programs and Features and arrange the list of programs in the order of their date of installation. 3] Check for recently installed troublesome programs and if needed, remove them. 1] Press Win + R to open the Run window and type the command services.msc. Hit Enter to open the Services window. 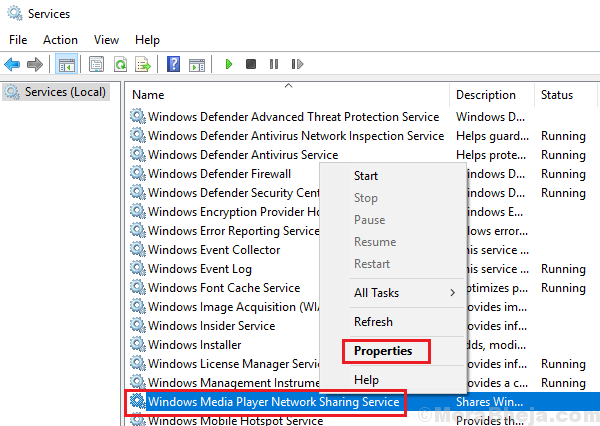 2] In the list of services, find the Windows Media Player Network Sharing Service. 3] Right-click on that service and click on Properties. 4] Change the Startup type to Disabled from the drop-down menu. Click on Apply and then OK.
We believe that by the time these solutions are exhausted, the issue would be fixed.